Please note that the content of this book primarily consists of articles available from Wikipedia or other free sources online. Rajinder Singh Bedi (1915-1984) was an eminent progressive Urdu writer, playwright and a Hindi film director, screenwriter and noted dialogue writer. Some of his best work as a dialogue writer can be seen in Hrishikesh Mukherjee's films Abhimaan, Anupama and Satyakam; and Bimal Roy's Madhumati. As a director he is most known for his films Dastak (1970), starring Sanjeev Kumar and Rehana Sultan and Phagun (1973), starring Dharmendra, Waheda Rehman, Jaya Bhaduri and Vijay Arora. 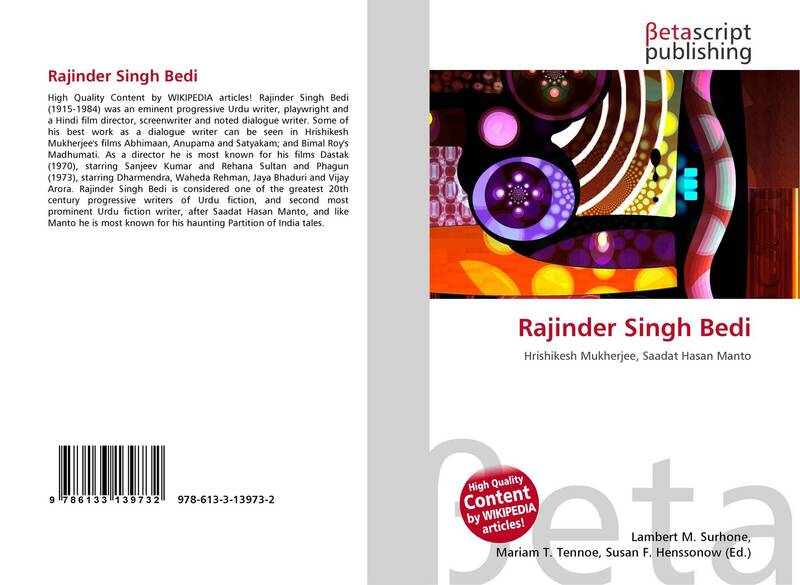 Rajinder Singh Bedi is considered one of the greatest 20th century progressive writers of Urdu fiction, and second most prominent Urdu fiction writer, after Saadat Hasan Manto, and like Manto he is most known for his haunting Partition of India tales.